Major construction companies in the UK are to compensate workers whose names were on a secret industry blacklist. The dramatic development follows years of campaigning by unions after it was discovered that more than 3,200 names, mainly of building workers, were kept on the list, drawn up by a shadowy organisation called the Consulting Association. Workers involved claimed they were denied work, often for merely raising legitimate concerns about health and safety on building sites. Legal action is being taken on behalf of some of those on the list. The eight firms announced that they are working together to develop a scheme to compensate construction workers whose names were on The Consulting Association (TCA) database. A statement said: “The companies — Balfour Beatty, Carillion, Costain, Kier, Laing O’Rourke, Sir Robert McAlpine, Skanska UK and VINCI PLC — all apologise for their involvement with TCA and the impact that its database may have had on any individual construction worker. “The companies have joined together to establish the Construction Workers Compensation Scheme. “The scheme is intended to make it as simple as possible for any worker with a legitimate claim to access compensation. “The companies have invited workers’ representatives to enter into a period of engagement to ensure that the proposed terms of the scheme are fair and effective. The group is also engaging with other interested parties. “At this time we are not able to share any further information on the proposed scheme. However, once engagement with the workers’ representatives has concluded, we will announce full details of the scheme which we would like to open to applicants as soon as possible. “We have discussed the scheme with a number of other construction companies. Unions welcomed the news, although some campaigners said more should be done. Justin Bowden of the GMB union said: “Firms admitting they engaged in a terrible abuse of the civil rights of thousands of UK workers is an important step. Unite assistant general secretary Gail Cartmail said: “These employers appear to be responding to union demands to ‘own up, clean up and pay up’. “However, any proposals cannot exclude the involvement of blacklisted workers and their trade unions. “It is now time for the unions and the employers to thrash out the details and build on these proposals, which look encouraging. “It must be a priority to get blacklisted workers back into work. Unite is calling on contractors to employ, and where relevant support the up-skilling of blacklisted workers. 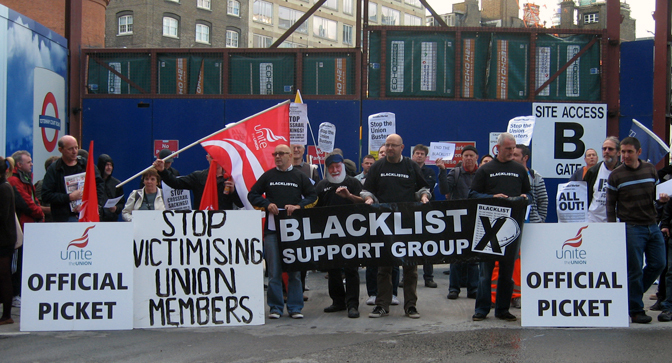 The Blacklist Support Group said it was not cracking open the champagne just yet, adding: “Blacklisted workers obviously welcome the announcement of an industry-funded compensation scheme for those they deliberately victimised as part of the Consulting Association blacklisting conspiracy. “But so far there are no firm proposals, only a vague promise of compensation for any workers with a ‘legitimate claim’. “Forgive us if we do not crack open the champagne just yet. We do not for one second believe that these companies have suddenly seen the light. Most of the senior managers implicated in the blacklisting conspiracy are still in post. The Consulting Association was closed down following a raid on its West Midlands offices by the Information Commissioner’s Office. But unions said workers continued to be discriminated against if their names were on the list. A total of 44 firms were found to be using the blacklist. The names of a number of environmental activists were also on the blacklist. Unions have called for a Leveson-style inquiry into the scandal.